Here you will find out how to install the Door Armor Max Combo Kit that offers platinum level protection. It reinforces the three weakest points of the door –the jamb, the hinge and the lock. Below is the old way of installing a previous model of Door Armor kit. It was more complicated to install. Luckily the latest model is very easy to install as shown in the above video. 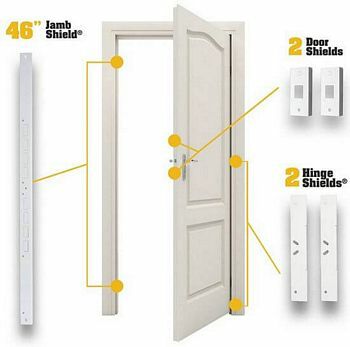 The basic steps for installation of the Door Jamb Armor applications. Open the door and remove the dead bolt assembly. The lock bolt itself can stay in place. Be sure to keep all the components for the lock together and separate from the other materials. Slide the door shield over the door. Position it so that the hole will be over the lock bolt still mounted on the door. The Door Shield should be centered on the holes where the door lock has been removed. With the Door Shield in place, reinstall the lock. The lock should be installed so that there is no interference from the Door Shield. Check the Door Shield and make sure it is level and flush against the door on all sides. Do not fully tighten the lock screws at this time. Verify that the lock functions properly without interference from the Door Shield. 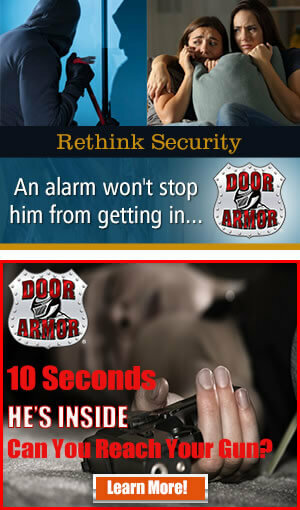 If there is interference adjust the Door Shield until the lock operates freely. Using the 1 and 5/8 inch screws included in your package, secure the Door Shield to the door slab. Now you may tighten all the screws in the lock. Make sure the lock functions correctly. If the lock operates correctly, the Door Shield installation is complete. This process should be repeated for all locks that require a Door Shield installation. Once all Door Shields have been installed proceed to the Jamb Shield installation. Carefully remove the interior door trim molding. This molding will be reinstalled later. Starting on the side of the door opposite the hinges, inspect the space between the rough frame and the door jamb. Locate all points that are attaching the door jamb to the rough frame as well as all shim locations. Using a saw with a metal cutting blade, preferably a handheld reciprocating saw, cut whatever attaching devices are currently attaching the door jamb to the rough frame. Any visible screws should be unscrewed where possible. This will separate the door jamb from the rough frame and allow the Jamb Shield to be placed around the door jamb. It is extremely important that any attaching devices have cut flushed with the door jamb. Failure to do so could hinder the proper placement of the jamb shield. Any shims in this area will also have to be temporarily removed to allow the Jamb Shield to slide into place. Please note if the Door Shield is being used in conjunction with the Jamb Shield, the shim thickness behind the jamb holding the Jamb Shield may need to be decreased. This will allow the screws to pull the jamb further toward the rough frame thereby allowing increased clearance between the Door Shield and the Jamb Shield. When positioning the Jamb Shield, make sure the holes line up with the corresponding holes in the door jamb. On the inside of the door jamb, the short leg of the Jamb Shield should fit securely against the finish frame and behind the weather stripping. Please note, if using an Ultra Jam Shield remove the appropriate knockouts so that the lock bolt holes in the door jamb will align with the knockouts. When the Jamb Shield is properly positioned, shim it into place. The shim should be placed far enough in so that the securing screws will pass through them. Do not break off the shims yet. By leaving the shims long, you will be able to hold them in place while pre drilling and inserting these securing screws. This will also facilitate further adjustment should it be necessary to correct misalignment between the Jamb Shield and the Door Shield. Remember if the Door Shield is being used in conjunction with the Jamb Shield, the shim thickness behind the jam holding the Jamb Shield may need to be decreased. This will allow the screws to pull the jam further toward the rough frame thereby allowing increased clearance between the Door Shield and the Jamb Shield. screws are over three inches so pre drilling should be deep enough to accommodate them. Check and verify that the door and the door jamb are still true and properly aligned. If so, secure the door jamb and the Jamb Shield to the rough frame with the supplied screws. The screw heads should seat flush against the frame. Again check to make sure that the door is true and aligned properly. Once the door is true, then secure the door jamb. Once this step is completed, proceed to the Hinge Shield installation. With the interior trim molding removed, locate all points that are attaching the door jamb to the rough frame. Also note all shim placements. Again it is very important that these shims stay in their locations or at least replace close to their original placements. Starting with the top hinge, remove or cut all bolts that penetrate further than the door jamb. Cut any other hardware that is attaching the door jamb to the rough frame and may interfere with the positioning of the Hinge Shield. It is extremely important that any attaching hardware between the door jamb and the rough frame be cut flush with the door jamb. Failure to do so could hinder proper placement of the Hinge Shield components. Clean off the inside jamb surface making sure there is no excess paint or leftover caulking. Then position the Hinge Shield so that the long leg will go between the door jamb and the rough frame. You may use one of the shims if necessary to hold the weatherstripping out of the way while positioning the Hinge Shield. by the weather stripping and should be flush against the inside edge of the door jamb. It may be necessary to tap the hand shield into place with a soft faced hammer. The pieces may rub on the hinges slightly as they move into position. Shim the hinge shield into position and use 11/64” drill bit to pre-drill the holes for the Hinge Shield. Be sure to drill through the Jamb Shield, the Hinge Shield, the door shim and at least one inch into the rough frame. The screws supplied with the Door Jamb Armor set are three and a half inches long so pre-drilling should be deep enough to accommodate them. Repeat the hinge installation steps to install the second Hinge Shield. Check to verify that the door and door jamb is still true. If so, secure the door jamb with the Hinge Shield attached to the rough frame. Remember to drive the screws until the heads are seated flush against the door jamb. If the door is not true take all necessary steps to correct this before proceeding. Once the door is true, then secure the door jamb as previously detailed. Remove one of the screws attaching the middle hinge. Shim the spot between the door jamb and rough frame. Pre-drill this hole and then install one of the three and a half inch screws. Once again the screws should be driven until they are flush with the door. Once the installation is complete, verify the door is true and operates correctly.